Henry S. Hippensteel was born in a log cabin in Wabash County and finished high school in North Manchester. He obtained degrees at State Normal School,Terre Haute, Indiana University and Earlham College. He received an MA from Earlham. He taught four years in district schools, was principal one year at Servia and then was principal three years at Manchester. He then began a period as Superintendent; first in North Manchester for five years, at Roann one year, at Eaton, Ohio two years and at Auburn for four years. In the fall of 1909 he was employed to head the department of Professional Reviews and Observation at Stevens Point Normal in Wisconsin. Soon after, he was appointed head of the English department at that school and held that position until he came to Manchester College in the early spring of 1916, as a successor to Professor Sandifur. The College newspaper of April, 1916 says, "Prof. Hippensteel is now a part of the school. He has arrived, met all of his different classes, has signed matriculation cards, has given his first chapel talk, and has attended a reception given in his honor by the faculty. He is living one block south of the college. He seems to enjoy the work here, and every student in his classes is enthusiastic in his praises for our new Professor. We are congratulating ourselves in our good fortune of having Prof. Hippensteel on our faculty." Hippensteel, his wife, Laura and their two sons, Clark, aged l5 and Vincent, 20 months settled in a home at the corner of Miami and Bond as he began teaching at the College. But within a few weeks he became quite ill and underwent an operation in Fort Wayne for gall stone and appendicitis. He did not recover. He was about 50 years old. His various educational assignments had made him widely known and respected. Both Manchester College and the schools of the town were closed the day of the funeral. His death was a loss to Manchester College and to the teaching profession in the State of Indiana. Mrs. Hippensteel later moved to Bloomington and taught there. Her older son, Clark died while a University student at the age of 20. 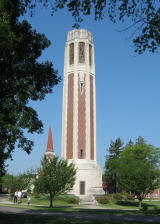 The younger son, Vincent, was a very active student at Indiana University as a writer for several publications. He had also done some writing for magazines. He accidentally shot himself while on his way to target practice and also died at aged 20. Laura was left alone. Mrs. Hippensteel returned to North Manchester and lived in the house on Miami Street renting part of the house to students. In 1957 she sold the house and went to live with a sister in Ohio.